The Stock Photo Guy - John Lund Stock Photographer: Can I Make Money With Cafepress.com? Can I Make Money With Cafepress.com? 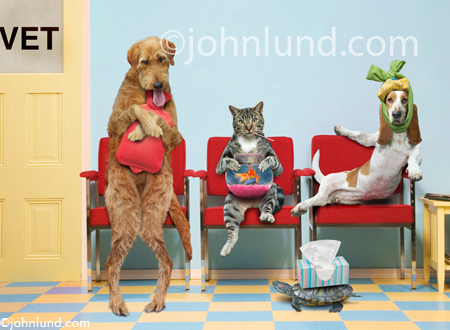 My best selling image on Cafepress.com, funny animals in a Veterinarian's waiting room! To date one of my biggest disappointments with my whole Internet monetization strategy is my Cafepress.com shop. The potential seems so enormous that I feel I must not give up on it just yet. In this blog post I will share some of my experience, thoughts and strategy in regards to cafepress.com and to print-on-demand opportunities in general. I started the Cafepress.com experiment about three years ago, but I have only put a couple of hundred hours into it. It seems like a lot more time because of the drudgery factor! By the time all is said and done it really takes somewhere between 2 and 3 hours per image to get everything sized, cropped, entered, key worded and so forth. But that is the easy part. Without actually counting, I think I have about fifty of my funny animal pictures up on my Cafepress.com storefront (I have a “premium” store). My best selling Cafepress.com image is one of various pets sitting in a veterinarian’s waiting room. Now why a scene featuring a group of miserable animals waiting to see a vet is popular…well, you got me! It sells as greeting cards, on clocks, wall décor (framed prints), T-shirts, mouse pads, clocks (clocks)? )…all kinds of things. Maybe veterinarians are the ones buying these products. But for my best selling, Cafepress.com image to have brought in, what, maybe two hundred and fifty dollars over the last three years? It hardly seems worth the effort! Another troubling aspect is that when I search for things like “Cafepress.com Success Stories”, or “How I Made A Fortune With Cafepress.com”, or any other similar phrase I can think of, nothing of substance comes up. Sure, Cafepress.com claims that there are people who make $100,000.00 a year…but as far as I can tell they don’t give any concrete examples. I can find people who share that they made $17.56 last month, or that they are making enough to go out for drinks once-in-a-while, but I cannot find people who are sharing what I consider to be success through their print-on-demand experiences. To me, less than $1,000,00 per month just doesn’t cut it, but I guess success is in the eye of the beholder. Disclaimer: I have spent very little time in Cafepress.com chat rooms or forums. Maybe I am missing something here? How Much Money Can I Make With Cafepress? Well, last year I made $802.00 on 469 sales with Cafepress.com. Not a whole lot of return, but to be honest, not a whole lot of effort either. The real effort for Cafepress.com is in driving traffic to your storefront. A lot of people believe they can build a home-based business that will support them using Cafepress.com. I think that the examples of people succeeding at creating a viable business that will support them on Cafepress.com, or I suppose Zazzle or any of the print-on-demand business models, must be extremely rare. Building the quantity of traffic needed to generate significant revenue from a print-on-demand business is extremely difficult and will take years, many years. If any of you reading this know of any examples of people have succeeded at that task in any significant way, please share it with us! So is cafepress.com worth it? I don’t know the answer to that, but I can speculate. I believe it is a mistake to think that simply putting products up on cafepress.com can bring in any significant money. To be successful on cafepress.com, and I have seen this mentioned time and again in the numerous online articles and forums about how to succeed with Cafepress.com, you have to drive the traffic to your shop. Without a commitment to driving traffic to your storefront, you just won’t make much money. On the other hand, if I am correct about my theories, if I can drive substantial traffic to my cafepress.com storefront, then the income will definitely be worth the few hundred hours invested in putting the images up. The huge potential audience of people who might buy a coffee mug, a print, or an apron from Cafepress.com tantalizes me. On the other hand, I am beginning to question whether I can ever really tap into that market. But as I already have a good number of products online, and I am building web traffic anyway, perhaps, in time I will reach the kind of sales that I consider successful. Again, the key to making print on demand work is in building traffic, and the dirty little secret of building traffic is the enormous amount of time it takes. This is very interesting, I just explored myself the same type of strategy as I went to a forgotten account with just a couple of images in Imagekind, and found around $ 100.- Is not a lot, but it was a nice surprise, so I am considering uploading some more images there. I too have images on Imagekind...and your right...very similar! But I have big plans! Your right on with the Justin Bieber analogy, but if I can get my traffic numbers up to where I plan to, then I could be looking at 10 or 12 thousand dollars a year in supplemental money for a minimum amount of work. Give me another four or five years and check back! you're selling your work at less than $2 an image? 2/ Are you totally crazy that you think there is a future in this? I assume you are referring to commissions off of, say, a single mug? The idea is to sell a lot of mugs. I have modest sales in Cafepress and Zazzle, however the Return per Image is higher than in Microstock. I do not spend too much in cropping/adjusting but use the bulk product creation. As you said, it is as usual in Internet a matter of traffic. I don't undertsand why anyone would want a CafePress account. After reviewing a Premium Account and if I am reading the example correct. You make $5 whole bucks. Let me ask, when is the last time you paid that kind of money for a t-shirt...oh yeah an Organic shirt. Is one supposed to eat this thing. 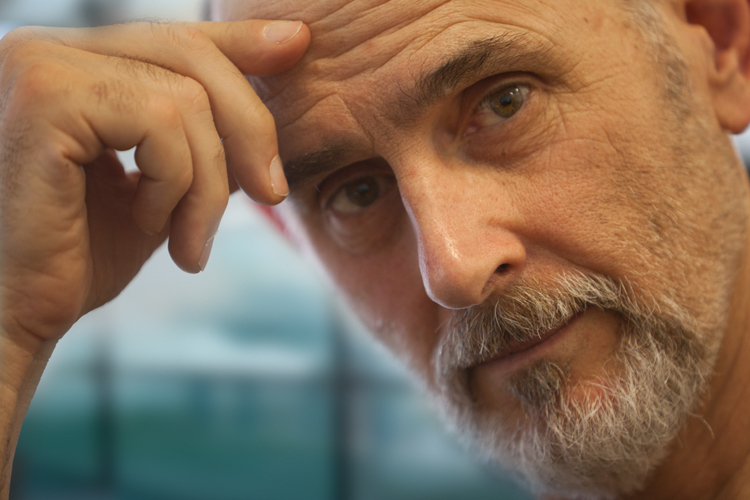 My motto is a FREE or super low cost front = LOW RETURNS. There are a lot better options out there...Photoshelter, Zenfolio, SmugMug Pro or Exposure Manager. Sure they cost more but you get a way better Business Model. It is all about marketing... yourself and finding that niche market. Can you give a link to email subscription for the new posts? Cafepress is just like anything else: You get back what you put into it. I started a Cafepress account 2 years ago and received little return. Since that time, I have loaded several designs on several different products. I have also done a lot of homework, such as teaching myself basic HTML to redesign my website as well as SEO strategies for driving more traffic to my websites to increase sales. It is true that a $5.00 commission on a t-shirt is not much. However, it can be if you sell 100 or more each month. This year, I have been receiving consistent commission payments of $650-700 per month. Now, I know I cannot quit my day job, but my 2 Cafepress stores account for $7500-8000 in additional annual income. I have a goal higher than this which I think I can accomplish in the next 1-2 years. You cannot build a successful store overnight. But, with some time and dedication at a steady pace, almost like running a marathon, the results can be rewarding. Interesting to hear your story. I'm a cartoonist and have thought about this vaguely for years, more seriously just this week. Almost every cartoonist does this, except me, I think, so I better at least try. Some of them do as well as the last commenter - several hundred a month. I like your goal of $1000 per month, John. That does make sense. Anon was referring to your own numbers - $ divided by # of items is $2, not mugs. I'm sure you know the reason it's so low - if people buy ONLY THROUGH YOUR LINKS you can charge your own commission, but if they buy in Marketplace - even while putting your name in search engine!! - you only get 10% of whatever price THEY set. Even though it's your artwork, your shop, your traffic. Like that. Will probly do both, but I read that Zazzle is more friendly towards artists, which sounds good. I like to look at Zazzle and Cafe press as my extra retirement money, that passive income that might pay a bill or two in about 7 years. So I slowly add new products and tweet about them. I sell a few things and get excited. I once sold 500 cards to an online card shop. Might never happen again, but it won't happen for sure if I don't have these accounts. thanks for a great article, I feel the same way as you. So if you had to choose would it be Zazzle or Cafepress? Cafepress USED to be a great place to create stuff, about three years ago. They keep changing the rules, and every time they do, it's to make sure the designers make less and less money. My earnings have plummeted to about one fifth of what they were -- and if tomorrow, CP decided to reduce my earnings to a penny per item sold, I wouldn't be surprised. Greed is the name of the game there. I've kept my stores open simply because I already made the effort to create them, but if I were starting out today, I wouldn't work with CP; it's simply not worth it. If you're exploring companies like this to make business with, try Zazzle. I hear they treat their shopkeepers with a lot more respect than CP ever will. Cafepress, for me, is the most fluid POD site out there. Most easiest interface. ( i use zazzle and spreadshirt as well) <--- those two drive in about 1/200 of what cp does. My shop has been open for 2 yrs now. My first month I did about $35... Month of the BP oil Spill. went up from there. Month where charlie sheen went bananas, I did $1600. I have approx 1000 graphics uploaded to CP, and am earning about $400 a month, not including xmas which last december brought in about $900. My goal is to get it to $2000 a month, while still working of course. But like anything, it's hit or miss. Depends on your aim and effort. Thanks John I really appreciate everything you have shared. I have visited several of your links. It has helped give me some direction on how to approach selling my artwork online. I uploaded an image in 2006 and forgot about it. I got an e-mail in 2010 that a check could not be delivered, so I went to Cafepress and updated my mailing information. Since then, I get about $25 to $30 a month and about $100 to $200 during the Christmas season. Not bad for spending 5 minutes on a black and white clock design 6 years ago. I just recently began uploading more designs to see if I could sell anything else. Right now, it's just drinking money. My husband and I both agree that you are a very talented photographer. I'm not sure if you ever gave Zazzle a try since this blog post but I spent only a few days on Cafepress when I came across your blog. That is when I heard others mention Zazzle. I checked it out and loved it right from the beginning. I closed my Cafepress store and went directly to Zazzle. I find it to be very user friendly as well as Artist friendly! I think your photography talent would work great on that site. Good-Luck and I sure hope to learn what you have with Photoshop! Almost 7 years ago I started a CP store. The store grew from $4 per month to $1,100 per month in 2 years. For what it's worth, we were awarded 'top shopkeeper of the month' 10 times over a 2 year period. We also had a zazzle store and it paled in comparison to CP sales. The year CP cut commissions nearly in half 4 years ago, my store went from $1,100 per month and $1,790 on xmas to about $275 per month and $600 on xmas. Since then I have built it back up to about $6000 per year. To get it back to $1000 per month requires time, 20 hours per month, I'd rather spend doing something else. Would love to turn my shop over to anyone who wants it - for a price of course. John, great article and I believe you pretty much hit the nail on the head. I do believe you can be successful on Cafepress, it just takes a lot of time. The upside though, which I believe is the value in Cafepress. It is a true passive income once you get it going. Will you become rich? No. Will you get surprise checks every now and then with almost no effort. Yes? Thank you for the info! I wanted to share my own personal results with you here. Based of your story and others I have heard, mine seems an outlier. I see it as a strange miracle. A washed up college age alcoholic, with a long history in minor graphic design (no formal training but have made websites and worked with various imaging software for fifteen years) I randomly remembered cafepress being what seemed like a way for me to make money with the only thing I had left- my netbook. I joined April 2012. It happened to be autism awareness month and something strange hit me and I made a unique design and posted it to my site along with an ethanol molecule shotglass. No money came. I moved and got sober in June and in December logged on to find that I had sold 24 items starting in October. Realizing that things for the shop (AS WELL AS MY LIFE!) were turning around, I went through and fixed some things up that in my old condition overlooked. My shop sales have increased exponentially. This month alone I have sold 22 items and the month isn't over. The autism Wareness design was a truly weet intentioned idea- the sales would benefit charity and I was proud even in a drunken state to just be part of it. Now that image alone brings in fifty dollars a month and that's just off my ten percent commission from the marketplace. I see it going very far very soon and assume my sales have increased litterally by others asking customers "where did you get that?!" I have now decided to stick behind causes. It seems to be a win for everyone involved and is work I feel good about. As an alcoholic on the right path, I'm in awe of this. It seems my case is a rarity. If ou want to see my shop and images, they're at cafepress.com/dezinezen . Thank you for sharing your experience and I hope mine may benefit you or someone else! As an experiment, just yesterday, I started a store at CafePress to see if I can make extra $$$. I created pet illustrations. Actually, pets and what they are really thinking. My idea was that people love pets right? And they love wearing an expression of that on their clothes. It is called the "physical manifestation of your personality". This will be an interesting and enjoyable experiment. Looking forward to the results and posting about it all. Thanks for your detailed answer to the question I just posted on google about Cafepress. I just have to say that your VET photo is done so perfectly; I see why it is a good seller. I'm looking at more of your work now...it's fantastic. You sound extremely arrogant Mr. Lund. $1,000 a month is not good enough for you? You complain about making about $80 a month on CP. How big is your family? Can anyone help me with the Cafepress.com? I have small problem with the shop that I have to fix. My Conclusion is to make $3000.00 a month on Cafe Press you need to upload/design 20 images per day at least 6 days a week for a whole year. Anonymous do you mean from selling images or creating your own products?